ROSEMARY HARRIS: This has been quite a year for me re: old pix, documents and even recipes which I have either stumbled upon at tag sales or have discovered in the course of going through the home of a recently deceased relative. Two days ago I received an envelope containing a batch of letters - all written in 1945 by a dear aunt. Sixty-six years ago she must have been in her early twenties and she was writing to her brothers who were in the service. They are surprisingly well-written for a young girl of modest means who was home looking after parents,nieces and nephews and the occasional girlfriend (my mother in particular. )They are wonderful letters filled with popular culture (she loved the movie A Bell for Adano), philosophy, spirituality and war news. 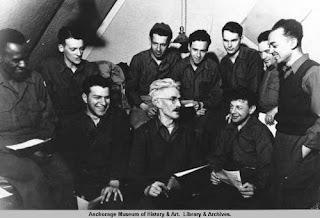 Like my father, Hammett was posted to the island of Adak. 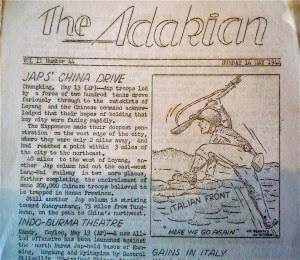 Hammett was assigned to write for the local newspaper, The Adakian. This is what is known as looking at the world through rose-colored glasses. Dashiell Hammett just returned from a two year stay in the Aleutians..He writes melodramas for the movies; stories that have a sophisticated touch, so that may have an effect on his romanticism for he paints the Aleutians as a place of beauty. The footing, he tells us is rather precarious, hence the average G.I. spends most of his time looking downward whereas he tells us he looked up and never saw more beautiful mountains and lakes...Mr. Hammett is too romantic...the bleakness of the islands, the hurricane speed of the wind are quite unromantic things and they should be painted with stark realism." You tell him, Aunt Mary! From this vantage point I'm guessing they were probably both right - from the pictures I've seen online Adak was wildly beautiful but barren and difficult. What a treat for me to find that my feisty, cigarette-smoking, scotch-loving 90 year old aunt was as much of a pistol in her youth as she was in her senior years! Amazing, Ro! It really does sound like a book for you...and it does remind us of all the things past--that were just as real for them as today is for us--that we'll never know about. -I think anyone who went to school at all in those days was better educated, better read, better at writing than many students today. Floating around the Internet somewhere is the test that students needed to pass to graduate from the 8th grade 100 years ago. Very difficult! -My adult sons (in their twenties) blessedly have embraced the value of letters written in ink by hand on real paper. You can bet I'm saving every single one, especially now that they are both living far from home. Fabulous story Ro! Does your aunt remember writing this? I think SJ Rozan may have gone to the Aleutian Islands as part of the authors to the bush program sponsored by Sisters in crime a few years ago. We should get her recollection! 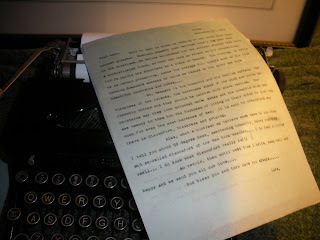 Reading someone else's letters - particularly from their youth - transports you to their world, doesn't it? My mother, who turned 90 this week, has several scrapbooks filled with letters from my father when he was fighting across Europe in WWII, a member of the First Infantry Division. Nearly 70 years later, the ink remains readable and the delicate air-mail paper is still intact. I've been allowed a few glimpses, but never given permission to read them start to finish. I'm sure that won't happen in her lifetime, Too private. She was 22 or 23, he was a couple of years older. They'd been married only four months when he shipped overseas. Because she's hung on to the letters I hope one day to step into the world they inhabited at that time. Holy cow, that SJ gets around - I'm still considering going to Mongolia with her next summer. Alas Aunt Mary passed away last November but she kept every scrap of paper, letter and telephone bill from the last 70 years so we just found these. Wasn't Carolyn Hart nominated for a Pulitzer for a book called Letters from Home? It would be mighty presumputous of me to attempt something even remotely similar. You've made me think of the little file cabinet in a closet in my parents' office with all kinds of correspondence that related to their writing. Of course no one who was there paid any attention to what anyone else might have wanted to hold onto when they died so it's all lost. Damn. Ah, old letters. Your post got me thinking about letter-writing and how much I miss it. I used to LOVE receiving actual paper with actual pen-marked thoughts on them. And I loved writing them too...So, how will the kinds of details and memories that you found in your aunt's letters be found three generations from now--or will they? I imagine someone saying, "I found an old CD-ROM with my great-aunt's emails on them, but I can't read them. Too bad the technology has changed since then." Ro, what a treasure! I love letters. I've used them as research for the back stories in a good many books. I lament the fact that we no longer write them. My mother wrote me every week when I was living in England and Scotland in the late seventies . . . I wonder where those letters are. One more reason to sort out my house. And, you have to remember too that Hammett had tuberculosis most of his life. Alaska isn't friendly for people with lung disease.